We went to the doctor this am. I’ve progressed a litle, now 2-3 cm. dialated, but that was about it. The midwife says my cervix is ripe and ready to go, I just need the contractions! The assistant asked what the heck I was doing there - I should have been at the hospital by now. She then commented that you never thought you’d be wishing for pain, but at this point, that’s what I want to feel! Enough of these teaser braxton hicks and contractions. We made an appointment for next Tuesday, but Chad’s determined that we’re not going to that one. My doctor appt. yesterday went well. I’m 2 cm dilated, 80% effaced and her head is in position (-3 for those of you that know the terms). The midwife had me make an appointment for next week, but said they might see me in the hospital before then! I made my appointment for next Wednesday AM because if I wake up the day after my due date, I want to know what the heck is going on. We’ll keep you posted. The nursery is ready, the clothes are washed, and the car seats are installed. Now we just need a baby to use all of these things. We still need to set up the playpin, bouncer and swing, but we were waiting until after the house was cleaned today to do that. Yes, we had someone come in and clean the house for us. It was very nice to have a team come in and clean all the places that I never get to or rarely think about, like the tops of the entertainment center and fan blades. Cleaning out to prepare the nursery and straightening up for the cleaning service also forced us to do some Spring cleaning around here, which I was happy about. We may have waited a little longer than normal to get the nursery together, but Baby Girl finally has her own room! Take a look. Make sure you check out Chad’s video walk through as well. We’ve also posted pictures from all of the baby showers. Well, the baby showers have begun. I was down in Birmingham last weekend for a shower, then had another one on Friday at work. Baby girl is getting lots of cute clothes and toys! There have even been a few gifts for mommy too! Next weekend, the girls from Bible study are giving a shower. For those of you out of town, I thought you might like to see the front of Christy’s card. It sure is creative. Thanks Eric! OK, so we’ve got the pool for guessing when and size, but the question we keep getting asked is what’s the name. As you know, we’re not going to tell you, but we’d love to hear your guesses. So, post your guesses in the comments of this post (remember you have to be a registered user to post a comment). Include first and middle name, and feel free to include multiple guesses. We’ll see who if anyone gets it. Guess away. or go to ExpectNet.com and enter BabySellers as the game name in the space indicated on the home page. 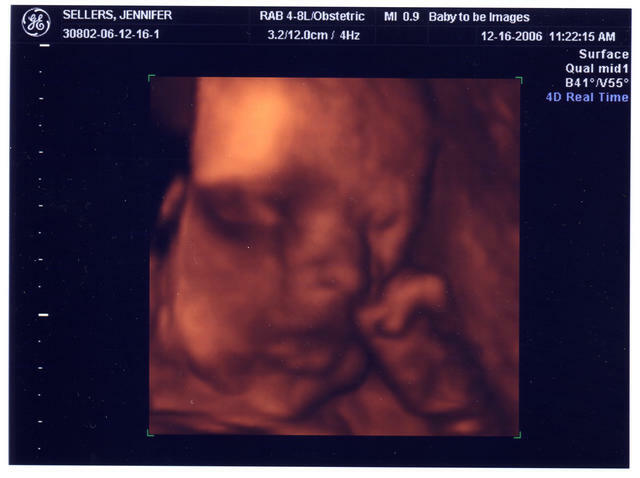 We had a 3D ultrasound done at Baby To Be Images back in December. 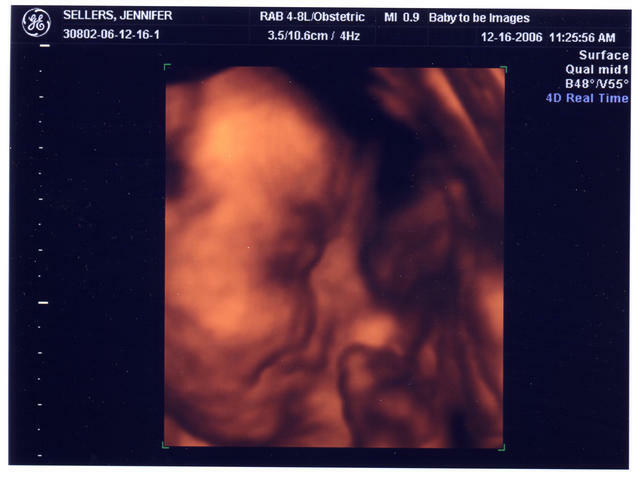 It was so neat to be able to see Baby Girl’s facial features and hands. My coworker’s comment was “it looks like a baby!” We also have a 15 minute video that we were able to share with our family at Christmas. It made my Grandma Dot cry…twice! The first picture is of her face and left hand. The second one is a profile of her face. Chad thinks she has my nose!